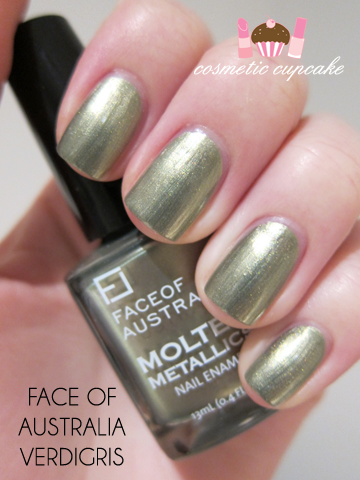 Today I have for you the last 4 lacquers that make up the stunning Face of Australia Molten Metallics nail polish collection. I know you don’t want to hear me blabber so let’s get right onto the pictures! You can check out Part 1 here. 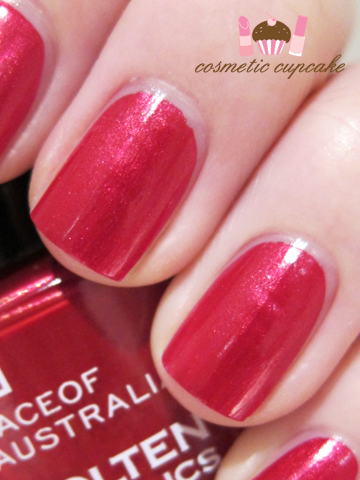 Flaming Lava - The absolute stand out of the entire collection and the hands down must have polish! 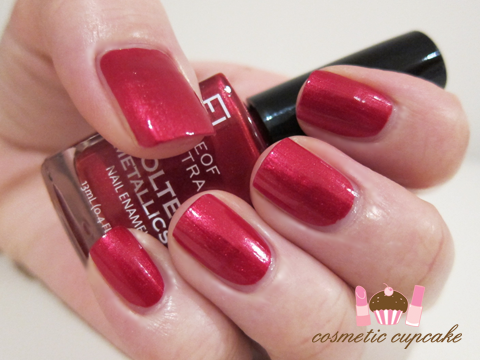 A glimmering dark red shimmer polish. 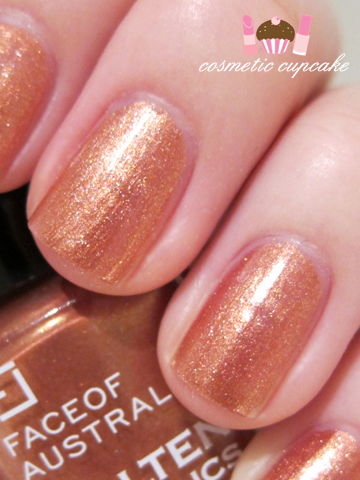 The formula is fantastic and it’s extremely pigmented, only 1 coat was needed for opacity! I’m going to have to try using this for stamping as I'm looking for an opaque red. It applied very smoothly and evenly and the brush was fine to use. It dried to a very glossy finish too. 1 coat pictured. 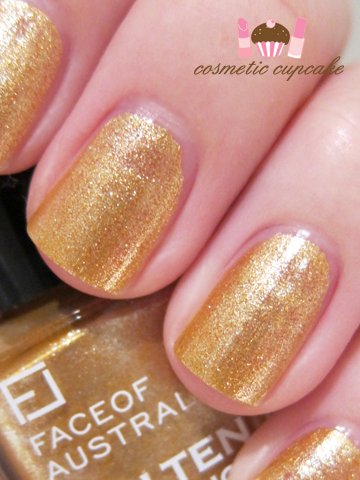 Gold - A very blingy and shimmery warm gold foil. 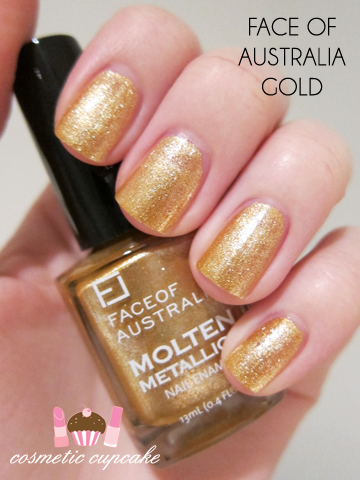 A must have for every polish collection in my opinion along with a silver foil! Again, a very pigmented polish only needing 1 coat for opacity. 1 coat pictured. Bronze - a bronzey/brown foil with orange and silver microglitter. 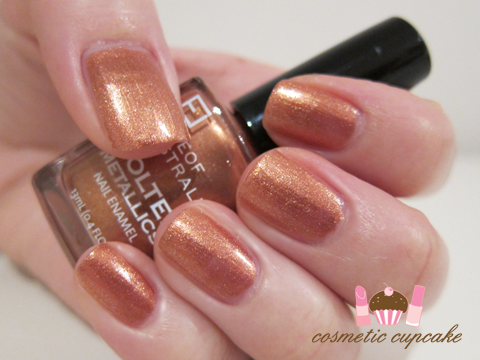 I'm not a huge fan of bronze polishes but I really liked this on me! It's a very pretty bronze and I love the shimmer through it and the way it looks when it catches the light. Another very pigmented polish which was easy to apply. 2 coats pictured. Verdigris - a beautiful olive green shimmer with blue and gold microglitter. It leans quite yellow and is a unique polish to my collection! Again, it's very pigmented but it's a little brushstrokey for my liking. 2 coats pictured. The only disappointment with the collection for me was the inconsistency of the brushes. I had real difficulties using some while others were fine. Oh and the fact that they only released 8 colours for the collection!! I would have loved to see a blue in the mix even though I’m not sure how it would fit into the molten theme though haha. I love all the colours but my must haves would be Flaming Lava, Amethyst, Iron Ore and Titanium. I think these are perfect hues for the cooler months and I highly recommend purchasing them! The Molten Metallics collection will be available from May – August 2011 and whilst stocks last. They will be available for purchase from Priceline, Kmart, Big W and selected pharmacies Australia wide for $4.95. 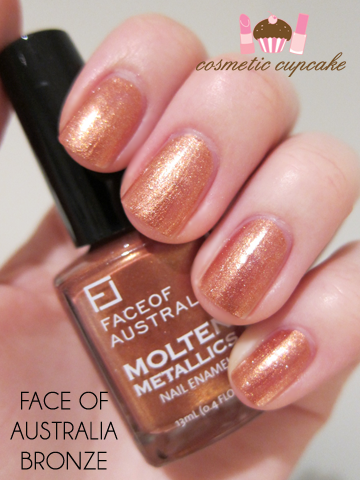 A HUGE thank you to Face of Australia for providing me with the collection to sample!! I'm so stoked to have been given the opportunity to try the entire collection. I was sent the above product for my consideration but this in no way influenced my review in any way. As always, my reviews are my 100% honest opinion. I need... NEED the red one. Please, please tell me... what is STAMPING and what is SMUDGING? I did the little stone things again today and I'm really happy!!! Did lucky luck lavender over all my nails except my R) hand ring finger where I did Mecca Margaret (a bright purple) and then put 3 little pink stones on it and a green heart. For a 2nd try it's not too bad. Do you know where I can get Hello Kitty's for my nails.. I LOVE HELLO KITTY and want Hello Kitty nails... Maybe I'll look on ebay. Oh my, these colors are gorgeous as well. I'm loving the first 3! Great review! 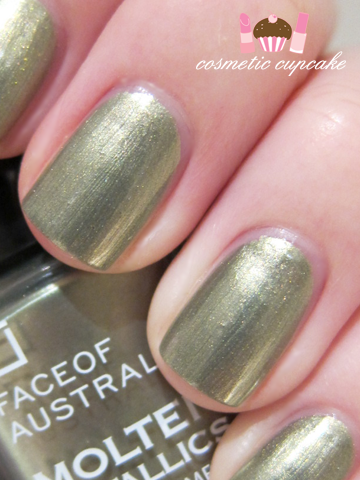 I need to find similar kinds of polishes here in the states...they're soo pretty! I love them all!!! Their all just so super dazzling! They need to get on making some of these over here :) I love Verdigris, such an unusual shade! I love gold; it looks beautiful on you! The red and gold are absolutely beautiful :) Makes me wish we had this brand over in the UK, since they're so cheap as well! Flaming Lava definitely stands out! WOW they are all so nice and pretty! @Mez: Yes you do!! It's my absolute favourite from the collection. Stamping is when you stamp images from image plates, check out this how to: http://www.konadnailart.com/contents/en-us/d60_konad_tips_tricks.html. Eeek that's so cool! I'm so happy to hear you're experimenting with nail art =D Your mani sounds lovely! Do you mean Hello Kitty nail plates or stickers or decals? @Amy: Verdigris is a really unusual colour! @tiffyama: I hope you find similar polishes from the States! I can't think of any dupes off the top of my head unfortunately. @Aysh: They are fabulous colours and unique to me too. I hope you get some in the UK too! @Alex: They are fantastic quality and for a great price too. 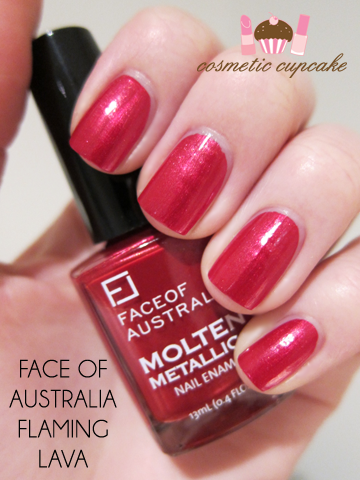 Hopefully Face of Australia will make it over to the UK soon! @Tassa: I couldn't agree more Tassa! @Joan: I love the whole collection but Flaming Lava is the standout. It's fantastic! @Oreleona: Glad you think so hun! @Ling: They are aren't they? Make sure you pick some up for yourself!